Wide Footbed Stirrups – Do They Make a Difference? For those of us with bad knees and wonky ankles, finding the right stirrup can make a real difference. Back in the “old days”, stirrups came in one flavor. Fillis. Then came the evolution of the stirrup into flexy, bendy composite things that cost orders of magnitude more than those plain metal ones. For a long time I scoffed at those expensive stirrups. Then my knees started to hurt. Then I developed tendonitis in my left ankle. I started looking more carefully at those fancy brands. I’ve had a range of the flexy bendy ones. I tried the Royal Rider composite stirrups (I actually dislike them because they are so light that if you lose one while riding it’s hard to pick it up again). I remembered that when I’d done a lot of trail riding one summer, I’d bought western endurance stirrups with wide footbeds. They’d been a lot more comfortable, even on really long rides. 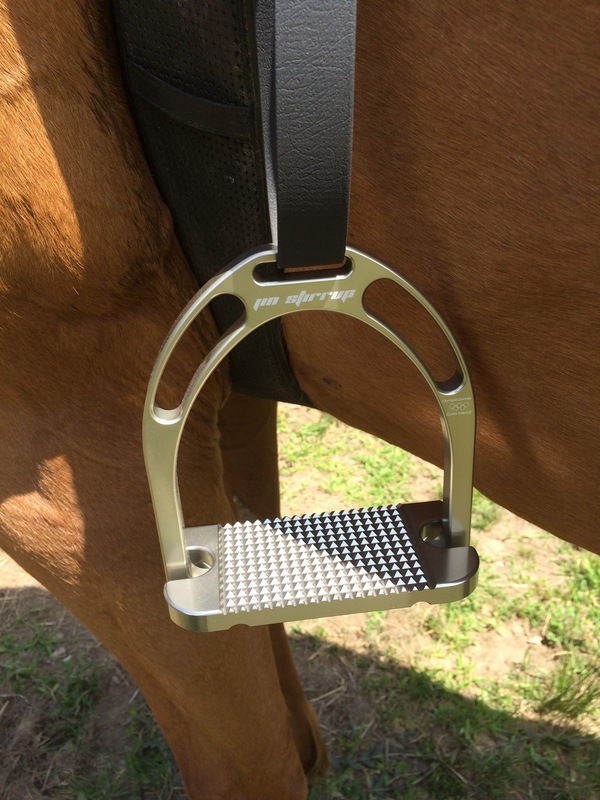 Then Tack of the Day had Jin stirrups on sale. If you haven’t been sucked into the wonderfulness of daily deals arriving in your inbox every week day at noon, sign up now. You’ll buy a lot of things you never knew you wanted needed and snap up some bargains in the process. So, do I love the Jin stirrups? Yes and no. I like the wide footbed and the tread pattern. The wider footbed is more secure, it helps my knees and my toes never go numb (the pain we go through to ride!). Overall, I think they provide more support and I am less likely to lose one, especially when riding in wet conditions. What I didn’t like about them is that I can’t use them on my Webber-style leathers. The buckle doesn’t fit through the eye hole. That was almost a disaster because I had to dig through my tack trunk to find regular leathers and I still don’t like the bulk under my leg. Well, that and the price. I still find it hard to swallow that stirrups cost more than $225. But if you can find them at a discount, they are worth a try. I think that’s an excellent suggestion. Certainly the sugar in carbs causes inflammation. We are already eating fairly low carb but we might become more draconian. Some of my knee pain is the lingering result of a dislocated knee cap from many years ago, but it still may help. Thanks! I have EquiWing stirrups that have a wide footbed, and they’re much less expensive than Jin or Royal Rider. They’ve helped a lot with my knee and lower back pain, as well as my feet going numb! I found a set of the Herm Sprenger bendy irons second hand… They just needed a little love! They’ve made a huge difference for me as I continue to heal my ankle from my break in 2015. It’s always worth looking into other equipment to alleviate your pain and make things more comfortable! I totally shouldn’t say that my brand totally endorses and even recommends the Jin stirrups, but I’m totally saying it anyways. They’re really the best!